There was no letdown for A&T against Gardner-Webb in Greensboro on Saturday as the Aggies stayed hot. After North Carolina A&T defeated East Carolina, Coach Sam Washington told the world to “bring me my money”. Besides the money, the Aggies are bringing in the wins. The team is on a 15 game winning streak, the longest in the FCS. They added to that total in their home opener against Gardener Webb from the Big South Conference. 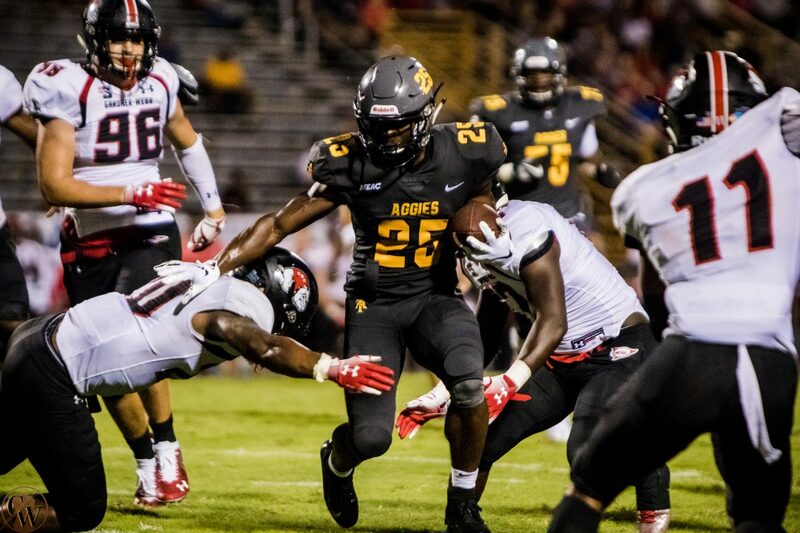 Jah-Maine Martin opened up the scoring for A&T with a 28-yard run. The Coastal Carolina transfer finished a 75-yard drive for the Aggies. Gardner-Webb responded with a field goal a little bit after. The score remained 7-3 until Kashon Baker opened the floodgates with a 78-yard punt return for a touchdown near the end of the second quarter. And floodgates were surely opened after that explosion on special teams. A&T went on a 31 to 3 run to finish the game with a 46-5 win. The highlight of the game was the Aggies rushing attack. In 44 attempts, A&T averaged 6.4 yards per rush. Marquell Cartwright led the rushing onslaught with 119 total yards and a long of 24 yards. Martin was not done putting in work. He added 93 yards rushing and added two touchdowns. Baker and Lamar Raynard also scored touchdowns on the ground. Lamar Raynard had a relaxed day throwing the ball with a 14-24 performance. He threw for a passing touchdown and 124 yards. Receiver Ron Hunt caught 90 of those yards. The Aggies are 3-0 and will face Morgan State next weekend.